Many organizations are falling behind fast when it comes to training the new generations in our workforce. 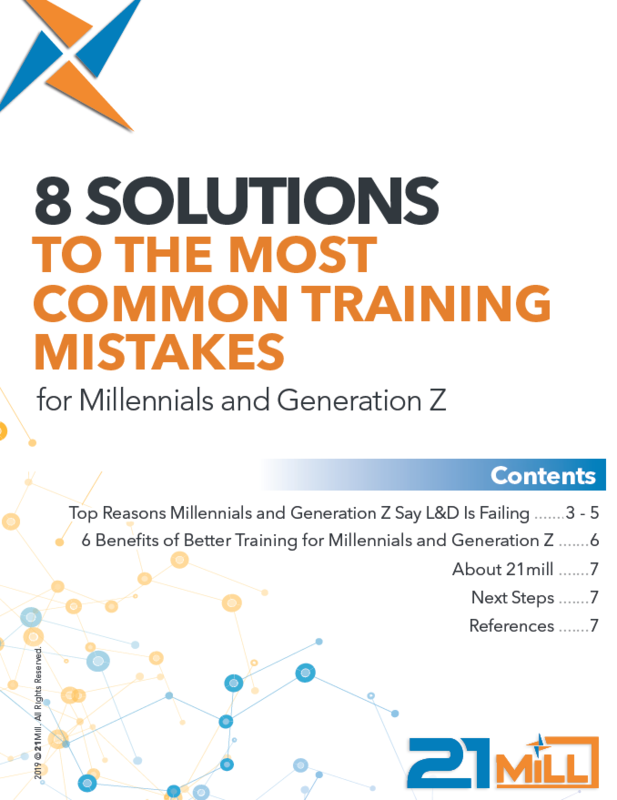 Learn about 8 of the most common areas We've found our next generations employees are struggling. ©2018 21Mill, Inc. All Rights Reserved. We’d be happy to provide a demo of the 21mill curriculum and platform for your organization. Please fill out the below form and we’ll be in touch soon. Please contact us if your organization would like a demo or if you have any questions. Even with new degrees, Millennials are often coming into the workplace seeking out learning opportunities. Millennials rate “professional growth and career development” as the #1 driver of engagement and retention at work. Harvard Business Review found that 40% of Millennials and Gen Z (vs. 67% of Baby Boomers) say their company’s leadership development programs are excellent. Meaning, the training that used to work is no longer relevant. Millennials love to learn, grow and “life hack” to productivity and success in the workplace. Provide them with 21st century learning tools that will bridge the learning gap and influence real change. Please fill out the form below and we will be in touch regarding 21mill’s Enterprise Solutions. A 21mill navigator will be in touch shortly.